This morning I got a welcome call from our friend Reiko B. in Los Angeles. We had written earlier about her parents in the Fukushima area- it took several days until we were able to hear that they were alright following the earthquake. They are still in their home in Iwaki, Fukushima, about 25 miles from one of the nuclear reactors. They have not wanted to leave their home, although many of their neighbors already have. For the past two weeks they have managed without water or gas by going every day or so to their uncle’s home up in the mountain area to bring back water, and by using electric heaters to try and stay warm. Reiko shared, though, that her dad injured his shoulder carrying the water, and they just found out that it is not an indefinite amount of time until the water comes on. Reiko is trying to convince her parents to leave for a few months. She is checking on government housing in the Sanda area so that they would be near us. We are willing to do whatever we need to do to help them move, and would even like them to come sooner and stay in our home. Reiko has been in touch with them daily, and I will try and call tomorrow. How hard this is for seniors to have their lives so turned around! We pray for God’s gracious plan for them. Today up in Sendai the guys took a much-needed Sabbath. Eric said that he was feeling a lot better tonight. 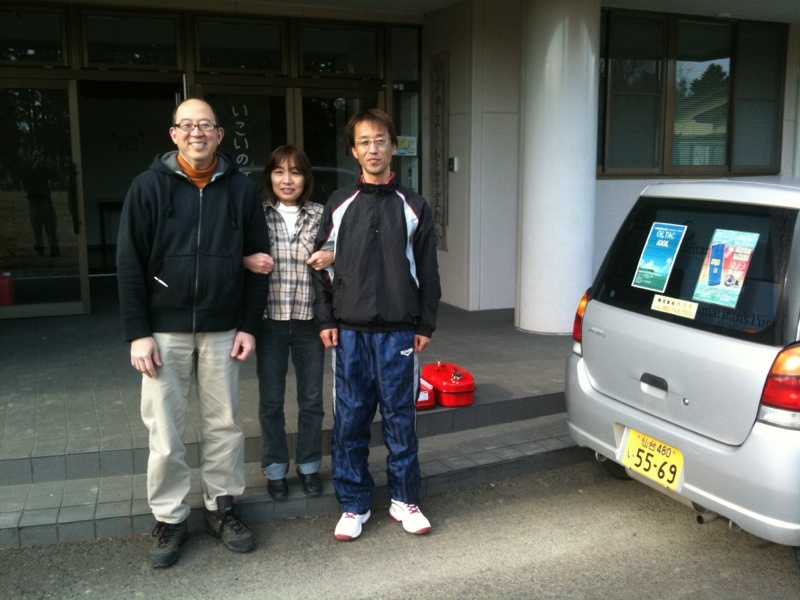 This afternoon, our friend Kazue and her husband came to the seminary where Eric is staying because he had some supplies for them. (From previous posts, their home was completely washed away with the tsunami). Eric saved them the embarrassment of opening each box to verify what they need, but rather the guys loaded them up with boxes and told them to pass on what they don’t need. They were able to supply some basic essentials, including underwear and hygiene kits, a cooking set, and even some gasoline that will help tremendously. We still are praying about how to more directly help Kazue and her family get re-started. They are looking right now for some kind of an apartment in the same area as their home was, but she said it’s hard to find such a thing for several things: a) all of the buildings have been affected by the earthquake, so little is known yet about damage done structurally to all of the buildings; and b) she mentioned that realtors aren’t exactly back to work right now. Pray with us that God will provide housing for them to help them at least get temporarily settled. My sister Hannah is leaving tomorrow already. What is so sad is that she has gotten a bad cold the last few days. Tonight her throat is quite swollen and she is feeling very miserable. I’m praying that she will be better and able to fly tomorrow early evening. We have had a low-key time this past week with everyone sick at different times, but many sweet times together for which I am very thankful.